June 17, 2010--I was so pleased to be chosen to participate in a volunteer project for Mt. Vernon, Alexandria, VA (George Washington's home). About 10 of us were invited to cross-stitch dining room chair covers (after submitting test samples of our work), copying a pattern used by Martha Washington in the 18th century. There are records of when, how much and the color of the yarns she purchased for these covers. Because they had deteriorated over the years, they were being redone to restore the room they'll reside in to its original beauty. It was a pleasure to be a small part of history in the remaking of these beautiful covers. 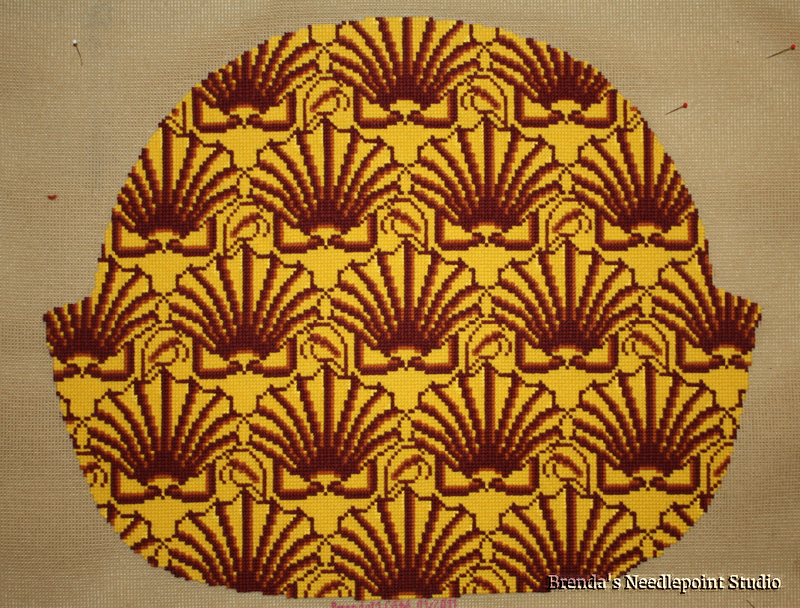 Below is the pattern from which we worked (designed by the wonderful ladies at Mt. Vernon Estates and Gardens). 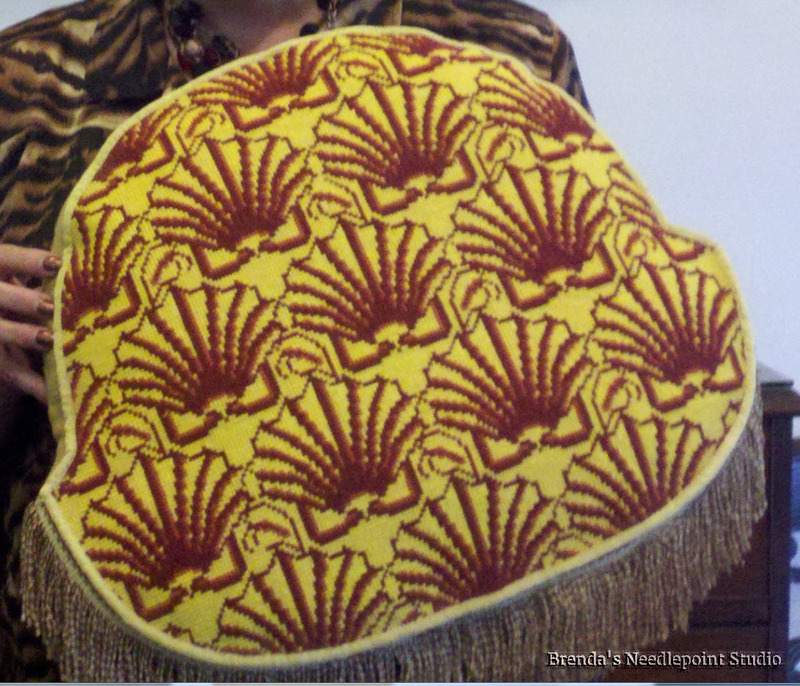 August 2, 2010--Completed the first row of the Martha Washington seat cushion cover. Very brilliant colors. 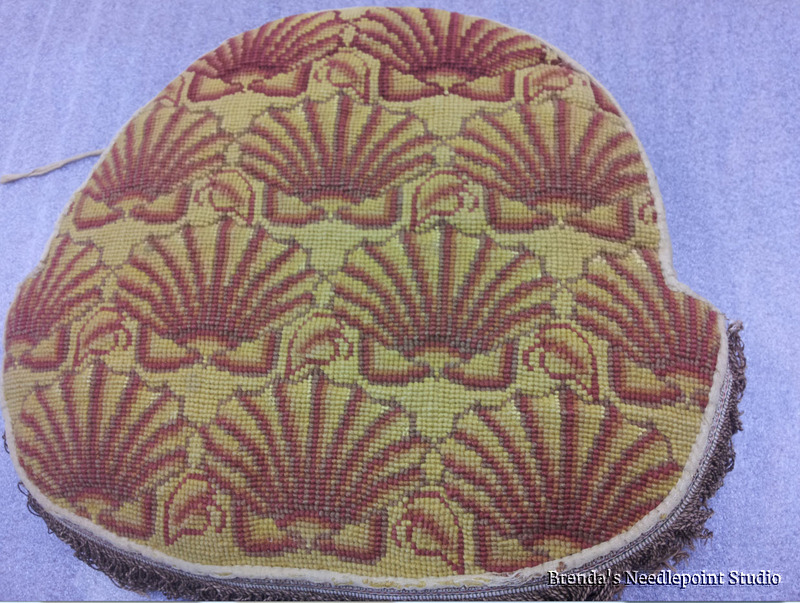 This portion is the back of the cushion cover as it sits against a curved back Windsor chair (very colonial, of course). 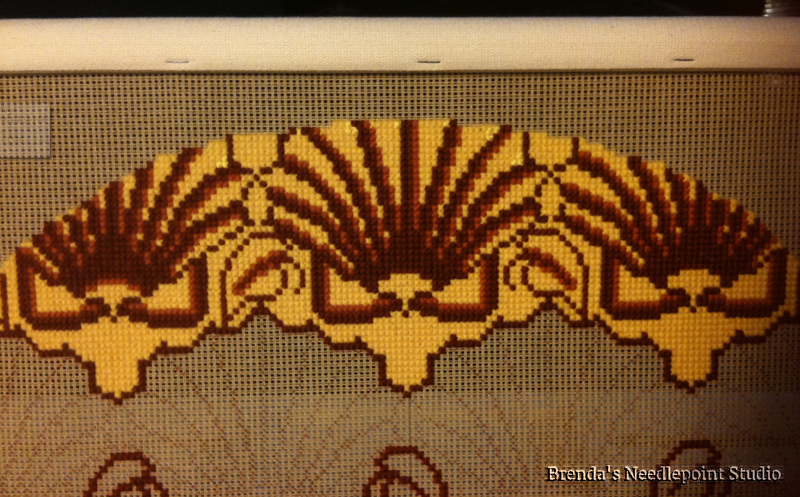 I outlined the design on the canvas before stitching so I didn't have to continuously count each step. August 18, 2010--Completed the second of five rows on the Martha Washington Mt. Vernon chair cushion needlepoint project. The third row was about one-fourth done. I calculated there were another 100 hours required to complete it. September 30, 2010--Completed the third and longest row of the Mt. Vernon seat cushion. At this point I was over one-half done with only two more rows to finish. 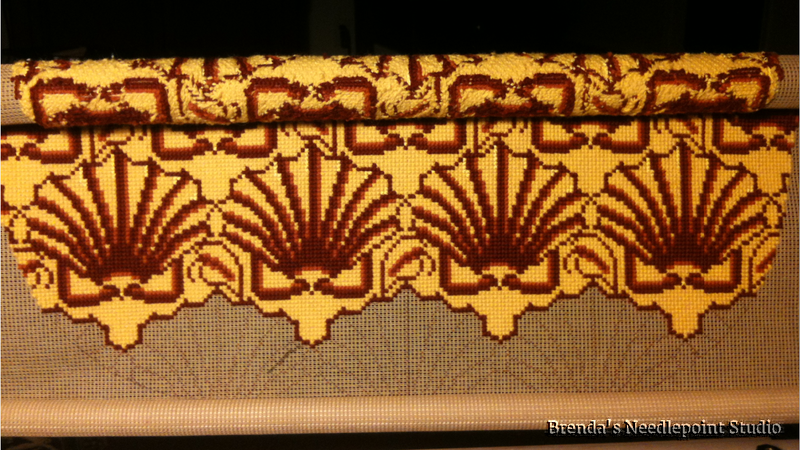 January 8, 2011--Next to the last row completed. 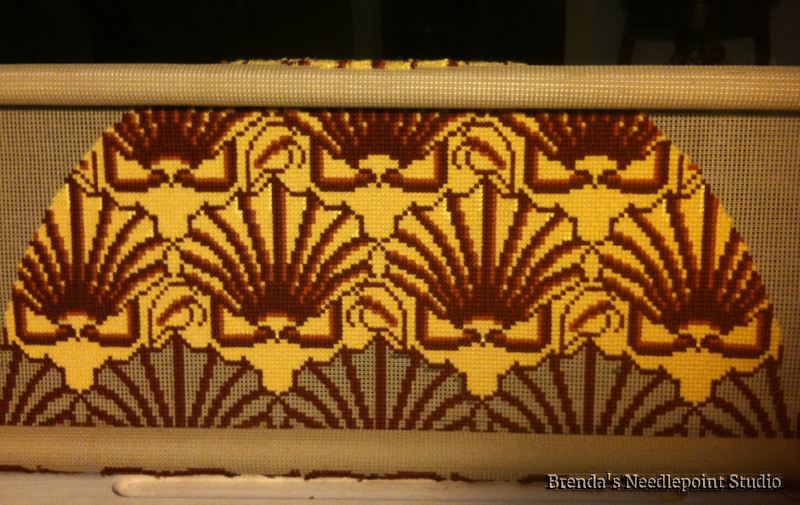 Just had the 5th and final row to do consisting of 3 shells. Almost done! January 26, 2011--It's done! 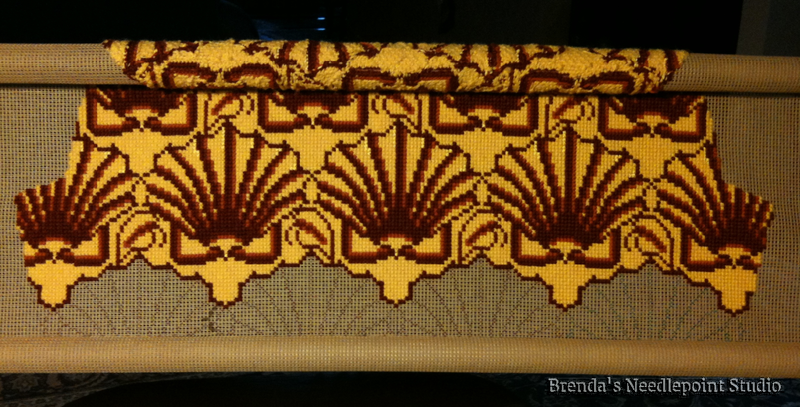 After 7 months and nearly 200 hours later, I finished the Martha Washington seat cushion. I was proud to be one of 10 to stitch these seat cushions for placement in the newly renovated parlor at Mt. Vernon, VA. I was looking forward to seeing the chairs with the new cushions in place. Below is a picture of the full seat cover. I made two very small errors which I now consider to be my "fingerprint". I can very easily identify the cover I stitched. I placed my name and date of completion in the seam allowance for posterity. This is the original seat cushion as done by Martha Washington. We understand she stitched a total of 12 cushions, but only 11 of them can be accounted for....Mt. Vernon has 10 and the family of L'Enfant was given one as a gift by Martha's niece. The 12th is lost to history. Here is a picture of the completed seat cover made into a cushion. Hi Randy. Did not know that. Where may I find out more about this? Thank you.